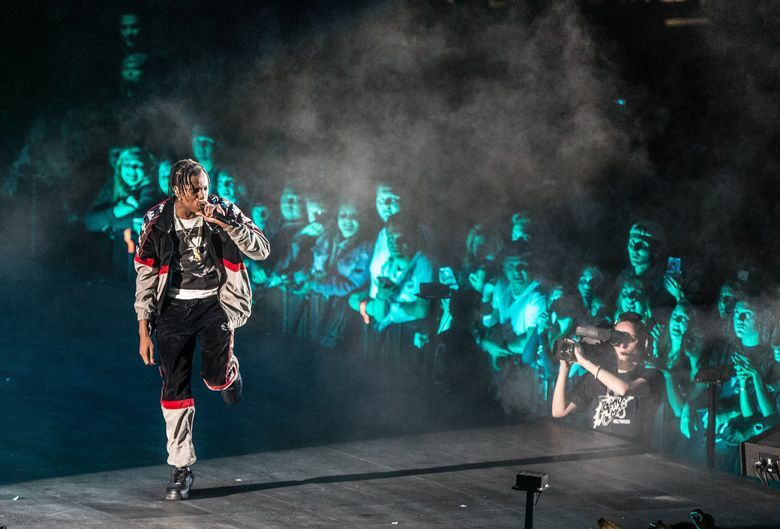 The hip-hop heavyweight brought his Aubrey and the Three Migos tour — minus Migos — to the touched-up arena on Thursday. The Tacoma Dome grandstand finally stopped shaking from the unsynchronized bounce of thousands of jacked fans. 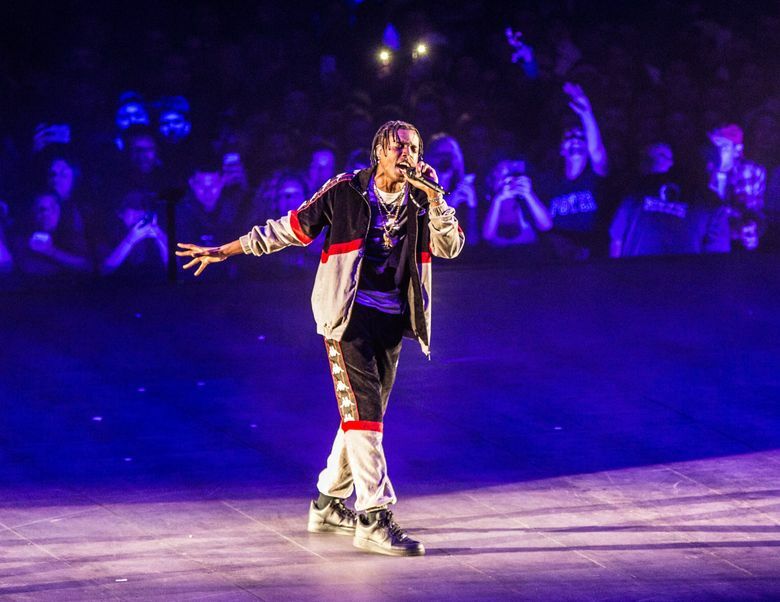 After shooting out of the gate with a couple of his best-known bangers, Drake, the chart-conquering rapper — who’s been hotter than a Kanye West take this year — went tactical, weaving around his light-up NBA-court-sized stage in the middle of the floor, placing him nearly at arm’s length from the crowd. The screams that filled any dead air up until then faded as the hip-hop megastar worked the arena, slaying each bar on a head-swimming “Know Yourself” like a coldblooded lyrical swordsman. In a word: savage. As a giant smoke screen shot up around the perimeter of the stage, it was clear Canada’s favorite rap crooner wasn’t playing around. The stunning spectacle was enough to (at least temporarily) make the packed house forget about his absentee tourmates Migos, who canceled hours before the show. Based on the lines, the Dock Street fish and chicken stand seemed one of the most popular new food options, though the fish and chips weren’t worth the wait. Instead of the usual flaky, golden-brown batter, the oversized fish sticks come encased in a thick, Tyson-style breading that might win over a middle-school lunchroom but underwhelmed at $15. But no one came for the food, and as Drake did full-court sprints across the stage to “Started From the Bottom” — the come-up anthem of the decade — the crowd was in celebration mode. 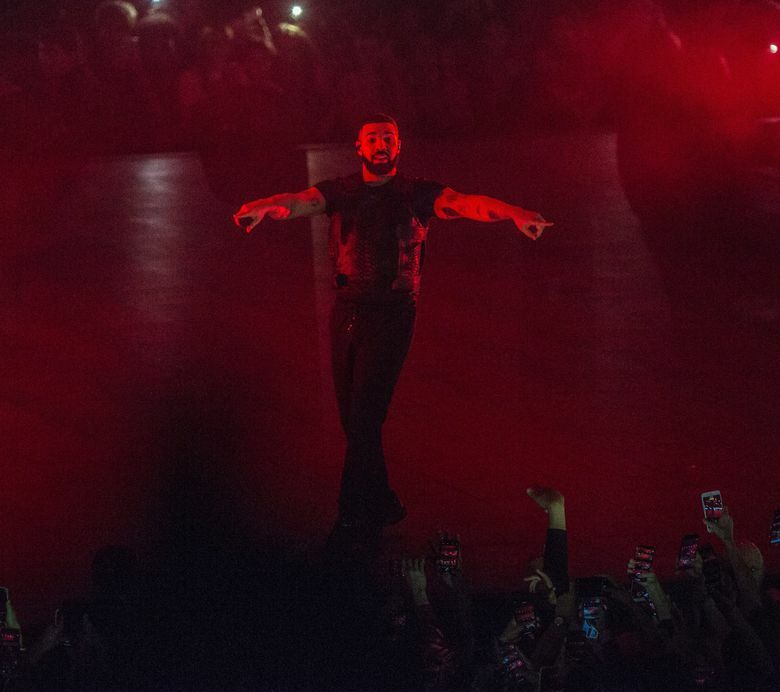 Much like his Billboard-occupying double album “Scorpion,” Drake loosely divided his set into “side A” and “side B,” front-loading some of his party-ready rap bombs like “Jumpman” (another riser-shaking favorite), with a third extra-hyped mini section to close. 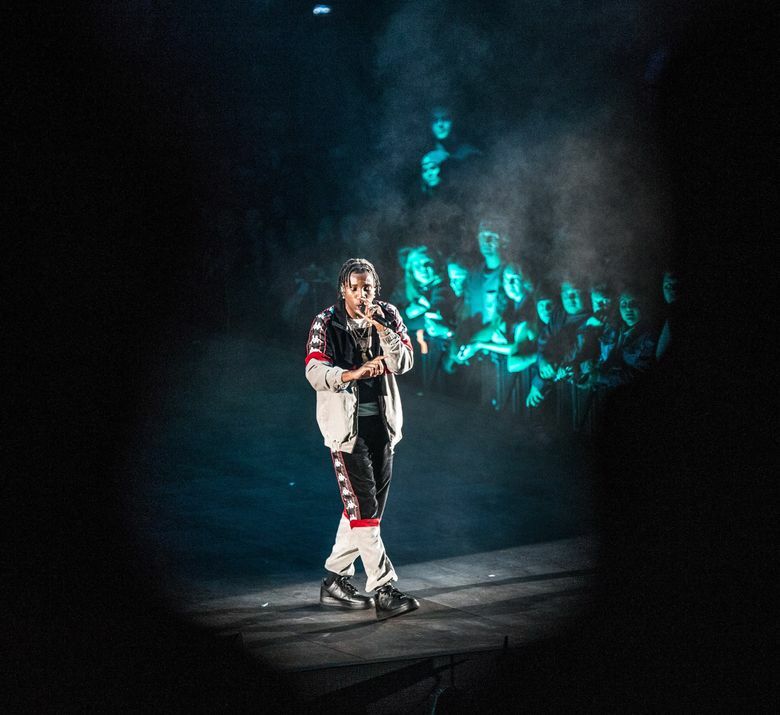 The split format worked better than anticipated, with the tour’s impressive production better lifting R&B Drizzy’s silk-pajamas aesthetic on the back half. 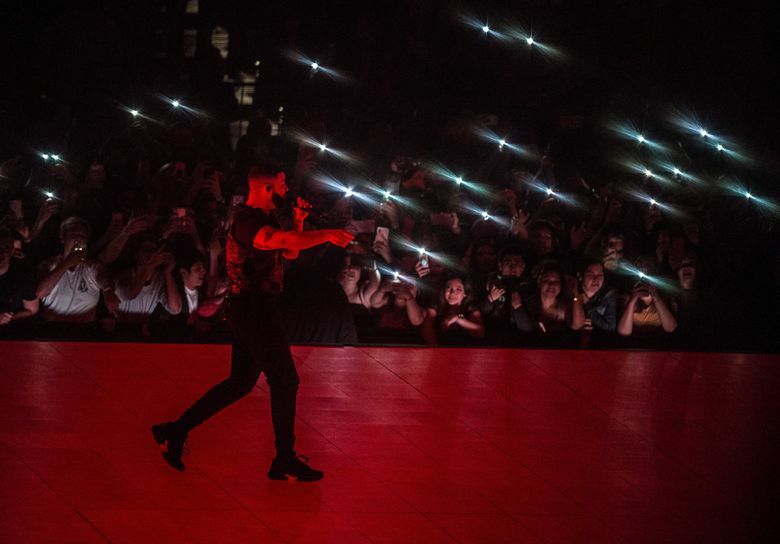 Rocking what might be the coolest arena-rap setup since Kanye’s instant-classic Saint Pablo run, the illuminated video board stage turned the floor into a massive infinity pool, cloudy sky and a giant cellphone scrolling Instagram videos beneath Drake’s feet. During a haunting “Elevate,” a swarm of mini drones hovered back and forth above his head, just minutes before a yellow Ferrari floated over the crowd as Drake bounced through his thumping Lil Baby collab “Yes Indeed.” Corny? A little, but can you make a Ferrari fly? 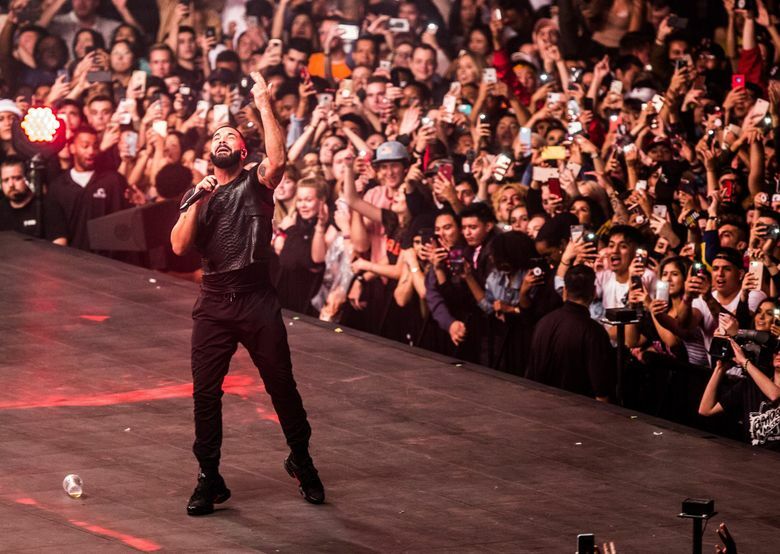 Like much of his 80-minute set, it served as a reminder of just how many hits Drake’s had his hand in over the years. 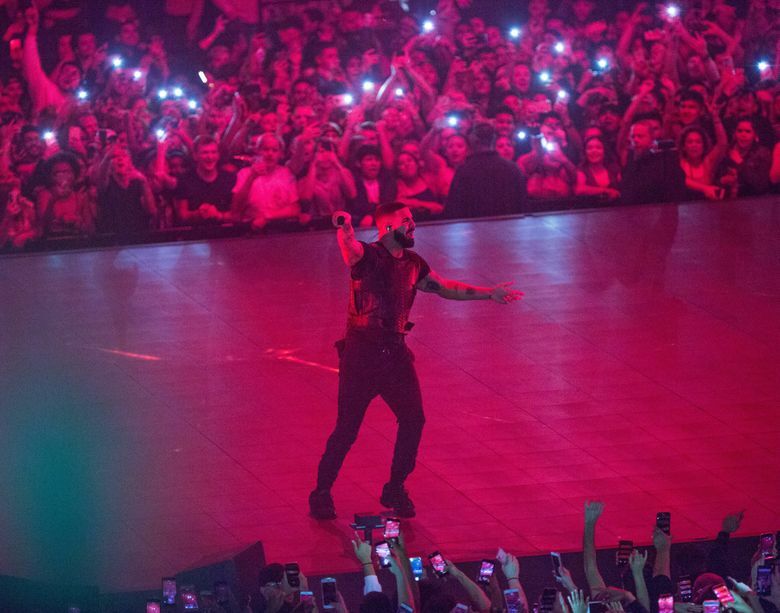 A following run through cursory snippets of fan favorites (“Hype,” “Headlines,” others) felt like a mixtape stuck on fast forward, none getting enough time to vibe with — or even grant Drake enough time to rap or sing them. 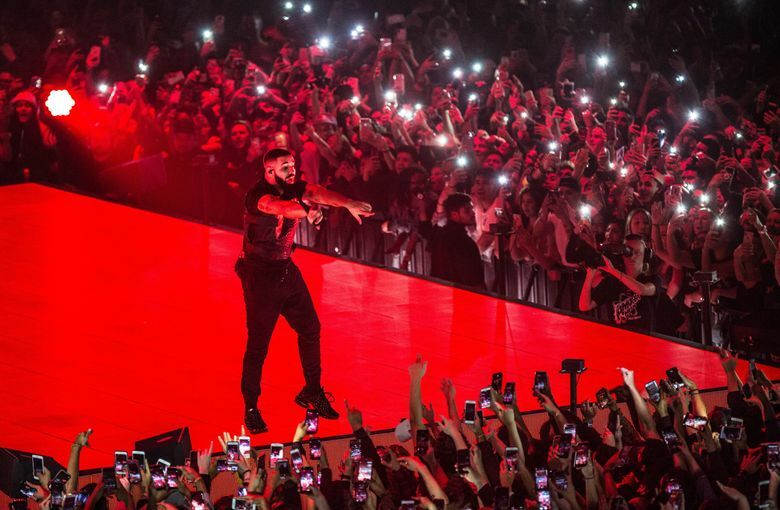 The abbreviated hit parade whipped Drake fans into a frenzy nonetheless and bolstered the feeling that this tour is an appropriately timed career victory lap after his summer Hot 100 coup. Through no fault of his own, the MIA Migos blew a significant hole in Drake’s set. Throughout the tour, Migos has returned as a halftime act of sorts, interjecting a mini set that includes the tourmates’ joint smash “Walk It Talk It,” one of the year’s biggest rap songs. 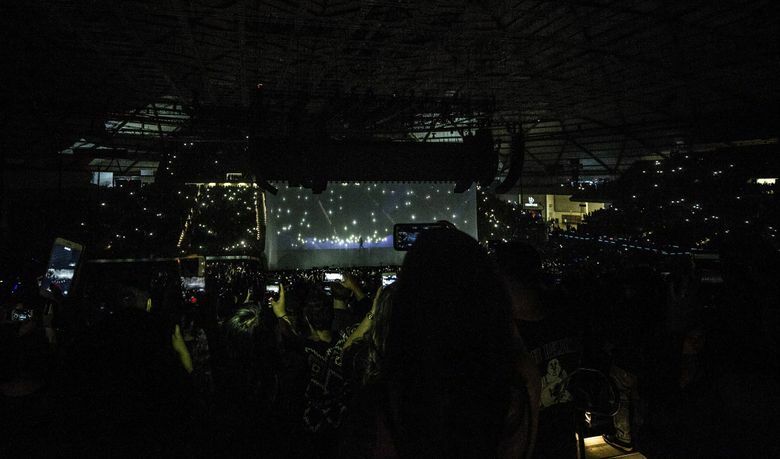 Instead, fans got five to 10 minutes of a DJ mixing more Drake hits while the rapper was offstage. While R&B Drake doesn’t have the vocal power that can fill an arena like, say, his countryman The Weeknd, his bedroom confessional style made much of the “side B” portion satisfyingly moody. Excessive delay got his soft vocals lost in the cavernous dome at one point, but his luscious “Don’t Matter to Me” — featuring a previously unreleased Michael Jackson sample — felt like a stellar end-of-night jam after a Beverly Hills pool party. As Drake closes out a banner year, this victory party was well-earned and, ultimately, a few missing guests couldn’t bring it down.